This time the spotlight will be shining on Qasir al-Wasat: A Night in-Between, which has you sneaking around a mysterious palace on a… triple assassination mission! But do be careful, for a single hit is all it takes to end your quest. Let’s see if we can’t help it escape the cold emptiness of Greenlight limbo. 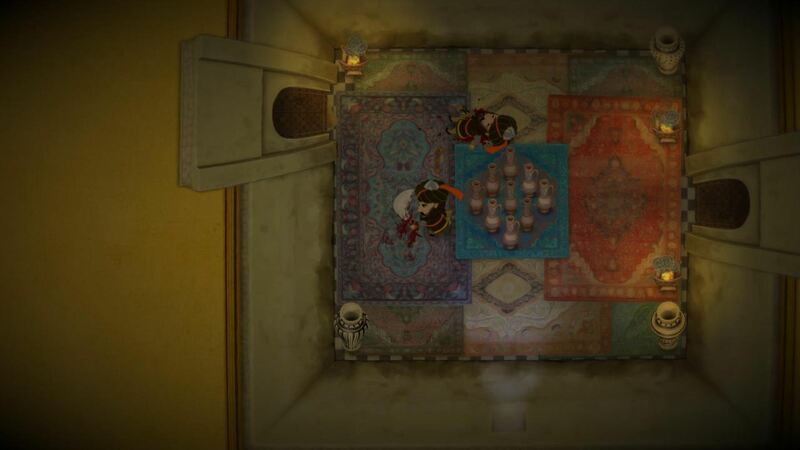 In a long forgotten Syrian palace, the summoning of an invisible creature takes place. A stealth mission is assigned: eliminate three targets and be granted their weapons. The spirit, a fragile being that can be taken down with a single strike of a sword, must avoid detection whenever possible. But how to survive, in a fortress that is filled with traps and vigilant guards? Eliminate three targets? Wow, piece of cake! Oh wait, traps and guards?! Hmm… that sounds quite troublesome. But at least you’re invisible in this one. No having to mess around with gadgets, or dash between shadows! And forget about taking out light sources; you’re a spirit, not some out-of-control NSA agent. There are certain benefits to this, however. While in ‘stealth mode’, you’ll be able to see hidden objects, levers, doors and such, on top of adding poison to your attacks. Doesn’t mean you’re going to be less fragile though, so avoid direct confrontation whenever possible, or… risk paying the ultimate price. Won’t be easy, but from what I’ve experienced, there’s still fun to be had. Besides, when was the last time you got to be all sneaky-sneaky in an ancient palace? So riddle me this, dear reader: why is Qasir al-Wasat: A Night in-Between still struggling to get through Greenlight? It’s been out for a while (since August 2012), so lack of availability is certainly not the reason. If you haven’t done so already, might I recommend visiting its Greenlight page and handing over a ‘yes’, if you like what you see? Remember: your vote matters! Qasir al-Wasat: A Night in-Between is available for Windows and Mac from the official website and Desura, priced at $10 and without any DRM.